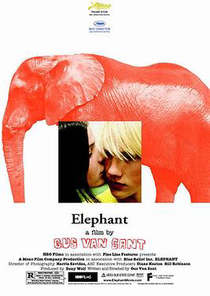 Inspired by the events which took places at Columbine in 1999, Gus Van Sant's low key approach to gun violence and a high school massacre could be considered a teenage version of Nashville, filmed in a cinema vérité style and spending much of the running time introducing a horde of various characters during a regular day at a typical American school, before culminating in a shocking and vulgar gunfire attack which would surely leave any audience member of good conscience watching with their mouth agape. The film utilises a cast of non-actors, many of which playing characters using their own names and the screenplay was largely improvised, with sparse dialogue throughout. Upon its release, the film was met with equal praise and controversy, with some claiming that it influenced a copycat event. In either case, it's a good advert for tighter gun controls and regulations in the USA, regardless of which side of the debate you stand on. The title is a reference to an "elephant in the room" (a colloquialism meaning an obvious problem which nobody is willing to discuss).